Last weekend I got to go to MeasureCamp London which as always was a great event, leaving me with lots to think about on how to improve analytics for our clients going into 2016. Measurecamp is an “unconference” where the focus is on knowledge exchange rather than a fixed agenda. At the start of the day a blank session board is created, and the attendee’s themselves fill in session cards to talk in each 35 minute time slot. The format means sessions that are as good as the attendees themselves, which in MeasureCamp’s case are the top analytics practitioners in Europe and beyond. Four people from IIH Nordic gave presentations which ranged from “Enterprise Analytics – making it big” from Peter, “Conversion on 3rd party party websites” from Florian and “Compared to What?” analytics by Steen. My presentation was in the same vein as my last Measurecamp sessions, focusing on how R can enhance the website data model. R is an open-source statistical programming language that is becoming more and more popular as the drive for data analytics grows. There are an estimated two million R users worldwide in 2016 of which 40% were added last year. The open-source nature and focus on making tools for data means that libraries are available that cover all steps of a data processing pipeline: collection, ETL, statistics, machine learning, visualisation and more are covered. One challenge in creating analysis that makes an impact to your business is data sitting in its own department silo, which can also mean data analyses unconnected to the broader picture. For example, your CRM team may have created advanced churn models and customer lifetime value calculations that are applied to your email segments, but the same analysis isn’t applied when that customer arrives on your website, to personalise offers and increase conversion. A good step forward is to link datasets offline to make conclusions you can apply across all departments. But wouldn’t it be better if your offline analyses could be linked real-time to your web data, creating predictions or adding meta data quickly enough you could show it to the user as they browse? The aim of my presentation was to show how this could be done by marrying the worlds of R and the data layer of Google Tag Manager. My talk went through the technical data architecture to link R with Google Tag Manager, using a content recommendation engine as an example. A live demo is also included in the documentation. 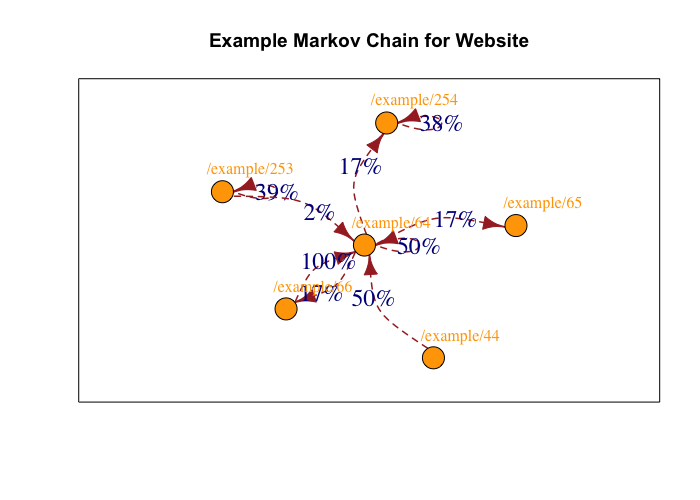 It demonstrates how a Markov model could be generated in R, that predictive model uploaded to OpenCPU, and then queried in under a second from Google Tag Manager to present a prediction to the user as they browse a website. Seeing it work live in Google Tag Manager really bought home what could be achieved, and how relatively quickly it can be done verses say off-the-shelf bought solutions. It was exciting to realise the possibilities! It is hoped that the talk is at least inspiring about what can be done using this approach, even if only certain elements are used. I like this as it gives us a path up the analytics analysis mountain: from reporting to prediction to prescription to automation. Linking to other data sources, using machine learning libraries or making predictions and suggestions are now all possible embedded within a website’s data model. I look forward to what you come up with, let me know on Twitter at @HoloMarked if you think of any good examples!